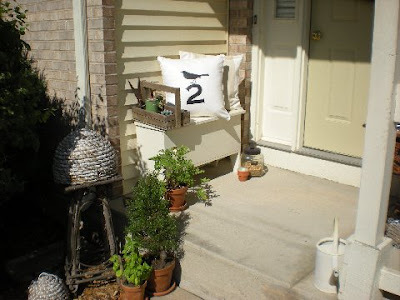 just sent me these photos of her porch with my pillows I made for her! Way to go Pat, it looks amazing! thanks for sending these my way! I loooove that bird pillow w/ the two...are you still making those? question for you. . ..
do you know or can you think of an inexpensive way for me to create a "built-in" or built-in look on one side of our fireplace? i wondered about possibly getting some unfinished cabinets, painting them and then trying to build a bookshelf above? i just thought you might now. you are such a wealth of info!!! I love those pillows!! How great for you to be able to see your product in someone's home! I am redoing my island, and am on the hunt for the Antiquing medium you used. I live in Auburn WA, could you share where you found it? Also, my island is similar in size to yours...how many bottles did you need?? Thanks so much...I just am running out of ideas of where to look for this! those pillows do look great! I also love the home pilloes you made a while ago. you inspired me to make some for a bench in my house. I also might have to order some number pillows from you. i am having a hard time finding number stencils large enough. do you do special orders? Happy customers indeed! I love that they share photos with you! It looks lovely. I love your work, the pillows are fabulous. They look darling! How fun to see them in their new home! I especially love the bird one! p.s. looks like you had fun in NYC. I haven't been in years, but I have always loved my trips to the big apple! Those pillows really make the spot. That was really sweet of her to send those to you. Someday I will get some of those pillows. I need to find a place. 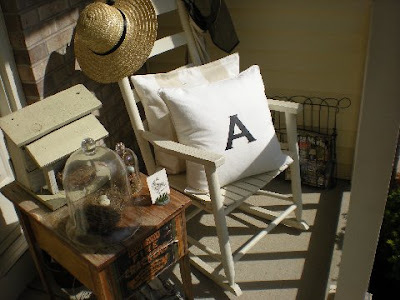 Love those pillows and her porch is Ammmmaaaazing! Awesome!